Enjoy the beautiful marina view and Hawaiian sunset. 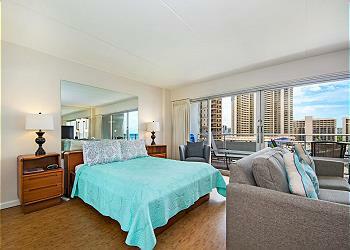 Clean huge studio unit with a King size bed and a Queen size sofa bed. Nice flat screen TV and a kitchen filled with cooking supplies ready to use if you rather prepare your own home cooked meals. Easy stroll to Waikiki, the Hawaii Convention Center, Ala Moana Beach Park and Ala Moana Center, the largest open-air center in the world. Discount available on weekly and monthly rates and will automatically be applied upon estimate being provided. 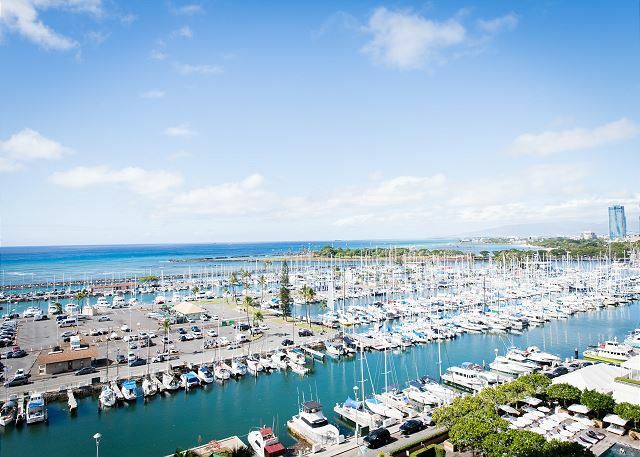 Paid parking is available on site, currently $28/day for Ilikai Hotel valet parking or $23/day for Ilikai Marina’s parking (Price and availability subject to change). This condo was exactly what we were looking for. A lovely lanai with a gorgeous sunset view. The kitchen had absolutely everything one might need from wine openers to cheese graters. I was pleased to find two bar stools at the counter which weren’t featured in photos as well as patio furniture for dining on the lanai as well. The pin pad lock was appreciated as we were able to check ourselves in and never fumbled for keys. My friend would have appreciated having an in room safe for his passport and extra USD, but the property felt very secure so he soon stopped worrying. Thank you for a lovely experience. I hope I have the opportunity to book this property again. Very easy to book with instant confirmation. 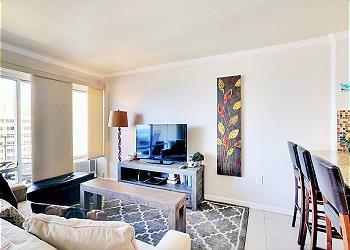 Apartment was as pictured, modern and very well equipped. Very easy access with key pad so not need for a key. Excellent location, close to many restaurants & bars, large shopping centre, parks and beach swimming areas. Had everything we needed for a 2 week stay. Lovely,welcoming condo! Love the kitchen, love the view, really enjoyed my stay! Some first night amenities would be appreciated; I arrived late & didn't have time to go to the store. Would have loved some coffee in the room for that first morning. Also shampoo /shower soap for the first morning. Kitchen needs salt & pepper. A little bit of paradice. Recently stayed at Apartment # 1031 for 10 days. The apartment was wonderful! Upon opening the door we were greeted by a couple of swans gracing the lovely and comfortable king bed. The view from the lanai was breath taking. Myland Realty was wonderful to work with and would not hesitate to book with them in the future. we enjoyed the patio where we had the meals. It would have been nice to have beach chairs, mats or towels. 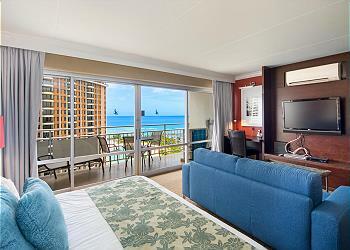 Stayed here in October 2018. Good location if you need to be near Convention Center. Easy walk to Ala Moana Center mall too. Building itself is old but maintained overall. Ease of access to beach mostly by walking into Hilton Hawaiian village next door. Ice cream shop on first floor of Ilikai was super!! Communication between managing realty company a little challenging if you are English speaking only, especially on the phone. Emails were sent but not accurate or reviewed well by Etsuko, wrong dates and instructions. Property was clean, furnishings and cabinetry outdated but acceptable. First time we used VRBO in Hawaii. The cost for the VRBO was the same as if we had stayed in one of the convention contracted hotel rates because of the added fees of this VRBO (cleaning fee, servie fee, etc). My friend's VRBO in the same Ilikai building gave them more towels, beach towels, cooler, boogie board, beach chairs for their use. This Apartment #1031 had very few things for their guests. Overall fine - we were just happy to be in Hawaii!! 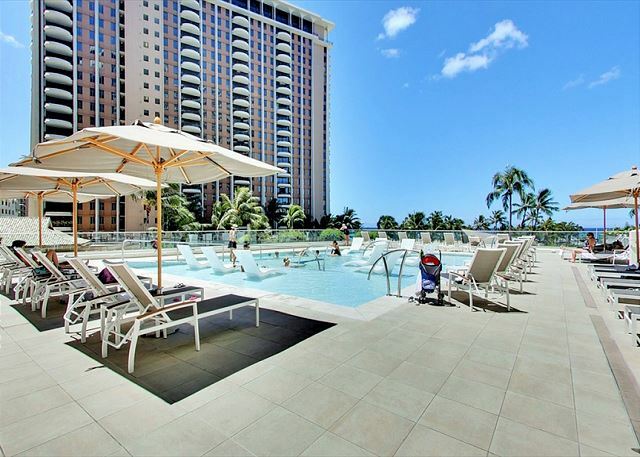 This was our third time staying at Ilikai and this condo was my favorite. One reason was because it was stocked with EVERYTHING. The kitchen had everything we needed and I really liked the rice cooker. We also arrived the week of Hurricane Lane and I was very happy to see the condo even had a portable stove with spare butane cans. If the power had gone out, we would’ve been okay. I also really liked all of the cleaning supplies that were there. The condo was clean, but I’m the type of person who likes to wipe everything down again before we use it. I enjoyed using the wet Swiffer that was in the closet lol. I’m a clean freak, so I wiped everything down before and after our stay. Yes, I sweeped and Swiffer’d the floor before we left. I think the only negative thing I have to say is the water faucet in the kitchen needs to be turned off a certain way or else the water keeps dripping. Hopefully this will get fixed soon, so they can save on water. Oh, and one more thing. We received a few phone calls to the condo. The first call was a wrong number and another call was an appointment reminder. It wasn’t a big issue for us. We always stay at Ilikai because of the location and we always walk to Don Quijote for our groceries since it’s only a 0.8 mile walk. 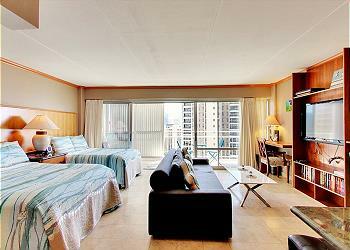 Ilikai is also located on the quieter side of the Waikiki strip. It was relaxing to have breakfast on the lanai. On some evenings, you can hear music from Cinnamon’s, which I enjoyed. I would stay at this condo again. I’ve looked for next year’s trip to O’ahu, but the condo isn’t available that month so now I have to look at other condos. Clean, compact, convenient. Great for family of 4. The room is clean and well/equipped with brand new bed covers and sheets. We stayed early July with 2 adults and 2 toddlers. We watched 4th of July fireworks right in front of us! The unit's view and location were fantastic. The new sheets and towels were greatly appreciated. The bands playing below at Cinnamon were excessively loud and ruined use of the balcony on several evenings. The king size bed was extremely hard and painful to sleep on. The vertical blinds are so old that the valance frame is yellow and so many slats are broken that it does not provide privacy nor block the sun from coming in. The balcony and furniture on it were filthy and my husband's socks were black each day from walking on the unit's floor without shoes.